With the successful completion of the ICO, the GTN token is currently trading on the Stellarterm Exchange. 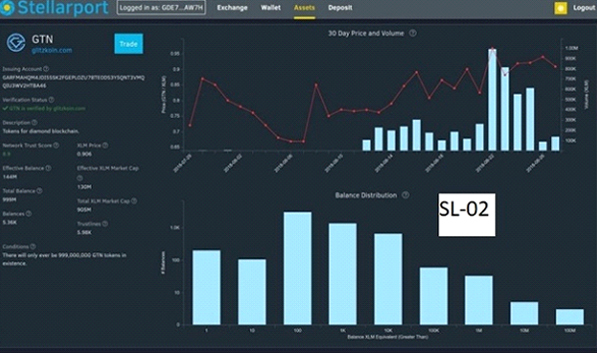 The trading activity of the token can be monitored on the STELLARTERM GTN TRADE resource. Just to recap, the ICO had a closing price of $0.20 per token. As the development of the DiaEx Diamond Exchange platform cruises on schedule, the token continues to maintain an impressive price range. The crypto world continues to show a keen interest in the GTN token months after, the ICO was successfully completed in June 2018. The efficiency with which the DiaEx Diamond Exchange (DiaEx) is moving through the development phase, is one of the main reasons for the positive mood. Scheduled to reach the testing phase in Oct 2018, the DiaEx should be fully implemented within the last quarter of 2018. Crypto enthusiasts should take, specific interest in the launching of the GLITZKOIN Diamond Exchange. Operating as a full fledged B2B and B2C diamond trading platform, the exchange will use the GTN token to settle payments. This obviously means that, the demand for the token will come from not one but two, active sources. While crypto world participants will trade on the exchange, diamond traders will also buy tokens to pay for their diamond purchases. GLITZKOIN is based on Stellar infrastructure the GTN token is therefore traded on the Stellar marketplace. GTN tokens can be purchased using Stellar XLM tokens. You would first need to use an exchange like Binance to purchase XLM tokens. The next step is to choose an independent client to trade the GTN token. Use this client to create a wallet to hold the GTN tokens. Transfer 2 XLM tokens into the wallet to activate it, this makes the wallet ready for use. You would now get your very own ‘private key’ to the wallet. Keep this key safe and away from everyone else, you would need it every time that you login in or trade your tokens. The next step would be to accept the GTN asset into your wallet. The link below will take you through the entire process and includes, screenshots to better explain each step. 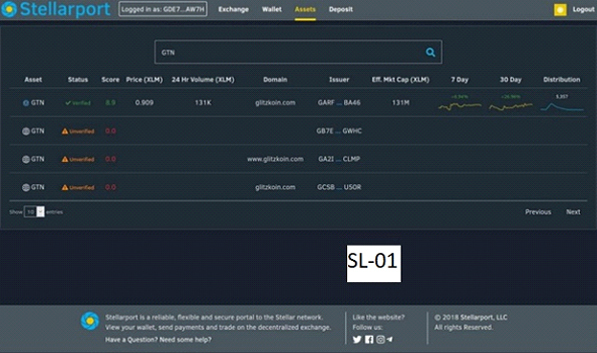 The GLITZKOIN GTN token is traded on the Sellar marketplace, this because the project is based on the Stellar infrastructure. The technical details provided here, will guide you through the process of buying GTN tokens. The activation process for the newly created wallet, will require the transfer of 2 XLM tokens into it. Use an exchange like Binance, to buy your XLM tokens. Keep in mind that, you will also need XLM tokens to ‘pay’ for your purchase of GTN tokens. With the wallet setup being completed, you will have access to your very own ‘private key’, do not disclose key details to anyone. You will need this this key to login to your wallet and also, when you wish to trade your tokens. To ready your wallet to receive GTN tokens, accept the GTN asset in it. CLICK HERE FOR DETAILED INSTRUCTIONS, on accepting the GTN asset. Just to repeat something that we mentioned earlier, the GTN token is trading on the Stellar marketplace. It is therefore necessary to pay for a GTN token purchase in XLM (Stellar) tokens. Before moving to the next few steps, here is a quick recap of what you would have accomplished at this stage. You would have used, one of the three independent clients mentioned above and created an XLM wallet to hold the GTN tokens. Transferring 2 XLM tokens, you would have activated the wallet. The GTN asset would have been accepted into the wallet. XLM tokens would have been purchased to pay for the GTN tokens that you would be purchasing. We will now guide you through the rest of the process, screenshots have been included to better explain the steps. Screen shots used to explain the steps, have been captured from Stellarport.io and other Stellar clients mentioned above would have similar screens. The ‘Verified’ GTN asset would be the first option [SL-01], click it. You should be able to view the trading volume and historical prices for the GTN token. This is shown in the screenshot appended below [SL-02]. Look for the ‘Trade’ button on the upper left side of the screen [SL-02], click it. 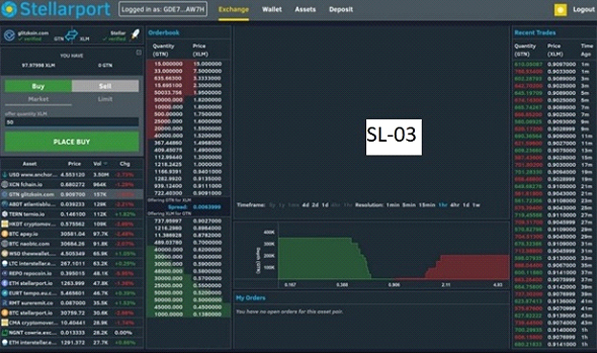 The screen that appears [SL-03] will display the current trading price for the GTN token – this is shown in terms of XLM tokens. Still on the same screen, notice the ‘Buy’ and ‘Sell’ buttons, these would be of interest to you if, you wish to trade in the GTN token. Step back a moment and recollect what you have been reading above. Payments for GTN tokens purchased, will be made using XLM (Stellar) tokens. You will therefore need to purchase, the corresponding number of XLM tokens to proceed with your purchase. This can be done, through a crypto exchange like Binance. 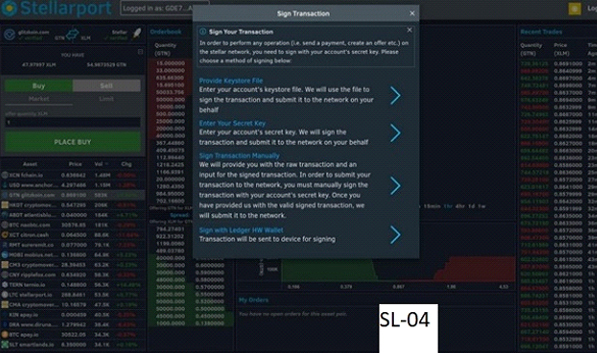 Once you have done this, the number entered in the ‘Buy’ option, would imply the number of XLM tokens that, you wish to convert to GTN tokens. It might be a good idea to read this STEP 3 paragraph twice to ensure that, you have fully understood the content. This step will require the ‘signing’ of the transaction. Of the options provided [SL-04], we would recommend using the ‘private key’ method. This is the key that we spoke about, right at the beginning of this report, at the time when you made and activated your wallet. Entering the private key will ‘sign’ the transaction and submit it to the network. You have completed your part of the transaction, wait for the notification confirming the GTN token purchase. Welcome to the GLITZKOIN mission, we will together be focused on revolutionizing the 90 billion dollar diamond industry. The first diamond blockchain to be promoted by a veteran from the industry. And at this point, the only Diamond Exchange to fully support diamond trade breaking, geographical barriers and eliminating the challenge posed by multiple currencies. With the GTN token being used to settle payments, the token would have an additional stream of demand generated by the trading activity.